This is the best comic book being published right now. There is so much going on in Daredevils life and i love it. I got so much of a kick out of this book i sat down with a smile and read it twice. Daredevil has been romancing the Black Cat. Which is good and bad. Good because DD has been really enjoying the time he is spending with Cat. It's Bad because Black Cat is only getting close to the Man Without Fear to retrieve a micro hard drive. A micro drive that Daredevil stole from five warring mega crime factions. Black Cat finds the drive but we are left unsure what she does with it. Foggy gives Matt Murdock a call to tell him that the cemetery where he dad is buried has started losing the bodies of people buried there. Meaning the ground is shifting and taking the caskets into the earth. Matt is so upset that he rushes out to meet Foggy. 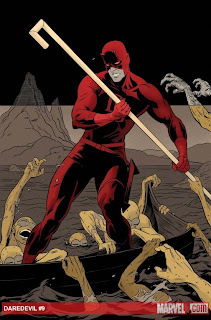 In a really awesome scene Matt heads out as Daredevil and when changing back to his Matt Murdock Id he leaves on his little red DD boots. After some snooping around in one of the giant holes in the cemetery Daredevil finds a large group of Moloids. Daredevil thinks back a remembers that the Moloids work for an old Fantastic Four villain The Mole Man. It's really cool that in this issue when we do see The Mole Man he's opening up a casket after casket. Some dead bodies fall out and after "seeing" this Daredevil freaks out thinking that anyone of those could be his dad's. I think that writer Mark Waid does a superb job of conveying the raw emotion of a son for the remains of his father. The Mole Man finds what his is looking for in the body of a blond that was in a casket. Daredevil has had all he can stand and leaps into action against The Mole Man and is given a jolt from Mole Man's staff. The Moloids then throw the worn out Man Without Fear off the side of a cliff into the waiting maw of some really strange looking monster that Mole Man has. Like i said the writer is awesome and the art by Paolo Rivera and his Dad Joe is amazing. Because of how great the art is i do take my time and gleam over the panels. The book has a very fun feel to it and it really reminds me of the old Essential Daredevil that i read as a teenager. Thanks to Paolo Rivera this book has a very silver age feel to it where most comics try to be dark and serious this is light hearted and fun. Which makes it worth it's weight in gold.